The Richmond Flying Squirrels, Double-A affiliate of the San Francisco Giants, are pleased to announce that the organization has been nominated by the Eastern League of Professional Baseball Clubs for the 2014 John Henry Moss Community Service Award. The league nominates just one team for the award, presented annually by Minor League Baseball. The John Henry Moss Community Service Award is bestowed upon a club that demonstrates an outstanding, on-going commitment to charitable service, support and leadership within their local community and within the baseball industry. Community impact has been a foundational focal point for the Squirrels since their inception in 2010. The Squirrels’ nomination comes following a season in which they continued to expand many of their community aims. That included the launch of the Squirrels’ new non-profit arm, Flying Squirrels Charities, created with the goal of growing opportunities for local children. 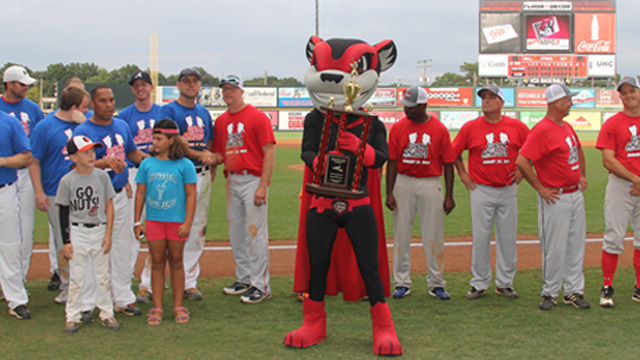 The first major fundraising campaign for Flying Squirrels Charities was “Smooch-a-Pig,” which included the involvement of 10 local celebrities and benefitted “Operation Renovation.” The campaign, which endeavored to rebuild 12 little league fields for the Richmond City Department of Parks & Recreation, raised over $60,000. The John Henry Moss Community Service Award is named after the longtime, former South Atlantic League president, who founded the SAL and presided over it for a half-century (1959-2008). The John Henry Moss Community Service Award will be presented at the Baseball Winter Meetings, which will be held in San Diego, CA, from December 7-11. The Richmond Flying Squirrels Charities, the non-profit foundation of the Double-A affiliate of the San Francisco Giants, are pleased to announce that the inaugural Smooch-A-Pig charity fundraising campaign raised nearly $40,000 for Richmond area youth athletics. Ten dedicated local business leaders and celebrities (listed below) executed vigorous fundraising campaigns for the honor of smooch Parker the Rally Pig at home plate during the Squirrels game on July 17th. While all of the participants went “whole hog” in their tireless efforts, Dan Schmitt from RMC events brought in the most bacon and won the privilege to kiss Parker. 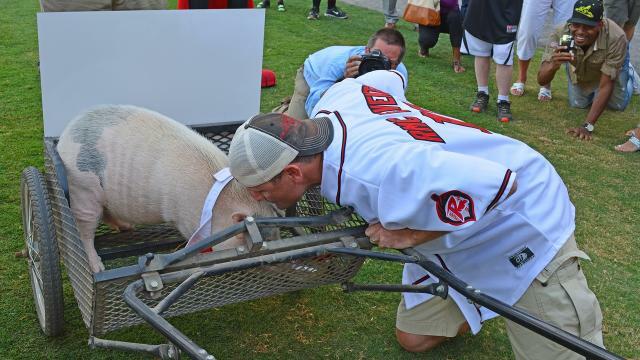 Schmitt brought along chocolates and a rose to give the celebrity swine and the two shared a special moment at home plate (photos attached) prior to the game. All the proceeds raised will go directly to “Operation Renovation,” a dedicated community impact project to renovate 12 Richmond youth baseball facilities (details below). Phase 4– recover and renovate unused fields as demands dictate. Battery Park, 2000 Fendall Ave.
Bill Robinson, 701 N. 37th St.
Blackwell, 16th & Everett St.
Chandler, 201 E. Brookland Park Blvd. Hotchkiss (Two Fields), 701 E. Brookland Park Blvd. Lucks Field, Rodgers & T St.
Westover (Two Fields), 1301 Jahnke Rd. Although the inaugural Smooch-A-Pig campaign is over, additional information and donations can still be made to Flying Squirrels Charities through the website www.smoochapig.com. Any individuals or business interested in getting involved with Operation Renovation and Flying Squirrels Charities can contact Squirrels Charity Liaison/Media Relation Manager Jay Burnham at 804-482-6791 or email at jay.burnham@squirrelsbaseball.com. 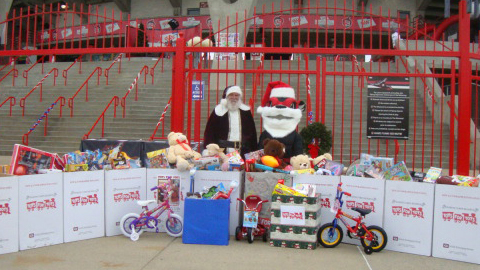 This article originally appeared on the official website of the Richmond Flying Squirrels1. Click here to view the original story. 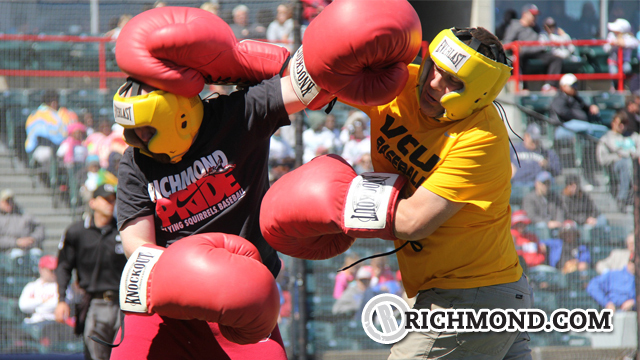 The Richmond Flying Squirrels, Double-A affiliate of the San Francisco Giants, are excited to announce the first ever Charity Big Gloves Boxing Throwdown on Saturday, May 17th at The Diamond. Proceeds from this evening of punishment, punches and mayhem will go directly to Operation Renovation, a community impact project to renovate 12 Richmond area youth baseball fields. Tickets are $10 and will be available at www.squirrelsbaseball.com. Several matches for the event have been announced and are listed below. Additional matches will be announced soon. The Main Event features political power with a display of regional cooperation. The official boxing ring will be placed near home plate and will include a referee and celebrity judges. The event runs from 6-8:00PM and Happy Hour drink specials will be available for the entirety of the Throwdown. Gates will open at 5:00 PM with the first bout set to begin around 6:00 PM. “This event promises to be one of the most fun and unique times that you and your family and friends could have for a great cause,” said Flying Squirrels CEM Chuck “Duking” Domino. All proceeds will go directly to the Smooch-A-Pig Campaign and Operation Renovation – a dedicated community project to renovate 12 designated youth baseball fields in the Richmond area. Tickets are on sale now at squirrelsbaseball.com. Questions or suggestions for additional opening matches can be sent to Flying Squirrels Media Relations Manager Jay Burnham at jay.burnham@squirrelsbaseball.com. 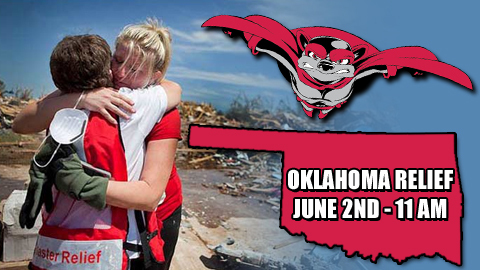 RICHMOND, VA – The Richmond Flying Squirrels, Double-A affiliate of the 2012 World Series Champion San Francisco Giants, are asking their fans to step forward and help the Oklahoma Tornado Relief Efforts on Sunday, June 2nd at The Diamond. The Squirrels will have a Better Box mobile storage unit in front of the main gate for items to be donated and shipped to a relief distribution center in Oklahoma. The items needed are specific and are listed below. The storage unit is scheduled to be ready outside of the main gate beginning at 11:00AM and will remain there throughout the Squirrels game vs. the Erie SeaWolves. Gates for the game open at 12:30PM with first pitch scheduled for 2:05PM. Fans who donate items to the effort will receive a raffle ticket to win one of several prizes. Winners will be drawn during the game. First Charity Golf Tournament hosted by the Dominion Club. 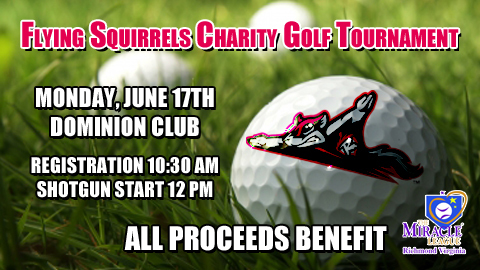 RICHMOND, VA – The Richmond Flying Squirrels will partner with Victory Golf Events to hold their first charity golf tournament, the Flying Squirrels Charity Golf Open on Monday, June 17th at the Dominion Club. All proceeds from the event will benefit the Miracle League of Richmond. The tournament will be played with teams of four competing in a scramble format along with a celebrity teammate. Celebrity teammates will include Flying Squirrels players, coaches and staff members as well additional celebrities from the sports and media community in Richmond. 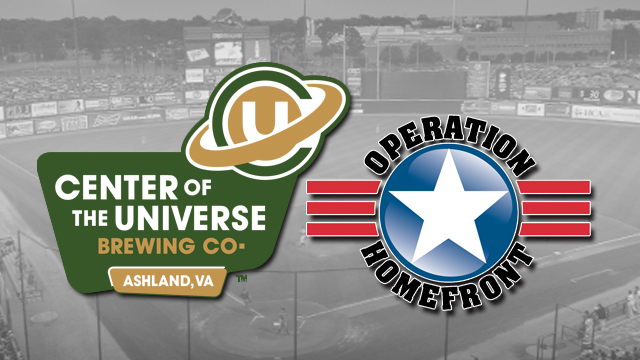 RICHMOND, VA – The Richmond Flying Squirrels will partner with Hops for Heroes to serve Homefront IPA at The Diamond during their game against the Trenton Thunder on Thursday, May 23rd. Homefront IPA will be available at the Squirrels’ Virginia Beer Taste the Local stand with all proceeds benefitting Operation Homefront. Operation Homefront is a non-profit organization that assists the families of military personnel when they fall on hard times. Additionally, the team will hold a special media tasting of Homefront IPA at The Diamond on Wednesday, May 22nd, at 2 p.m. All media members are invited to attend/cover the tasting. 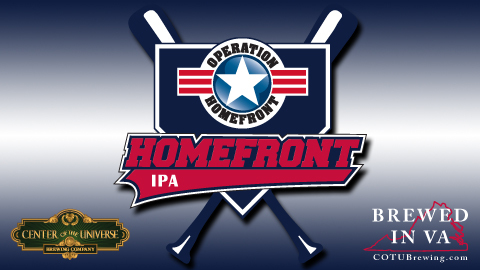 The goal of Hops for Heroes is to raise money and awareness for Operation Homefront through the sale of Homefront IPA and its relationship with the craft brewing and professional baseball industries. Operation Homefront is a non-profit organization that assists the families of military personnel when they fall on hard times. From car payments to medical bills, Operation Homefront provides financial assistance for all types of family emergencies. For more information, please visit www.operationhomefront.com. In 2012, Hops for Heroes expanded to include six total breweries from all over the country. Each brewery has been paired with their local Operation Homefront chapter. 100% of the proceeds from the sale of the beer will go directly to the local chapters. In addition to the breweries, sponsors have volunteered to donate some of the hops and grains to lower the cost of producing the beer and thus increasing the donation to Operation Homefront. Hops for Heroes has professional baseball player ambassadors for each of the breweries associated with the project. This allows for an increase in awareness of the effort and the charity. Louisville Slugger has also donated six laser-inscribed bats for each brewery. The media tasting on the 22nd will also include media availability from Flying Squirrels’ personnel, Chris Ray and members of the United States Military based at Fort Lee, located in Petersburg, VA.
Tickets are currently available for the Squirrels game on May 23rd, as well as to all remaining 2013 home games. For more information or to purchase tickets, please visit SquirrelsBaseball.com, call (804) 359-FUNN (3866) or stop by the Flying Squirrels Ticket Office at The Diamond. 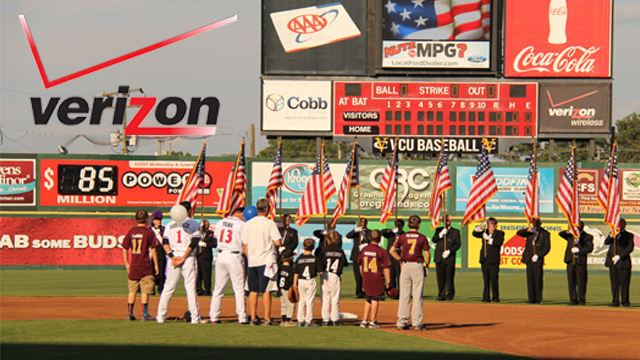 On Saturday, June 19, the Flying Squirrels partnered with Budweiser to honor the troops for Military Appreciation Night. Hundreds of soldiers and military personnel enjoyed a game at The Diamond. Support US Armed forces collected donations by offering acorn cut outs to fans to show their support of the troops and raised over $1200 dollars that was used to make care packages for the troops overseas! 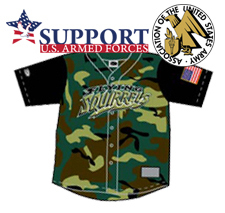 The Squirrels also held a “Camo Jersey off the Back” Auction raising over $1,390 with all proceeds benefiting the Robert E. Lee Chapter of the Association of the United States Army (AUSA) that supports soldiers at Fort Lee and throughout central VA. 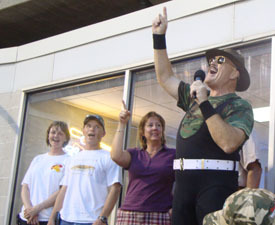 Fans were entertained by WWE Hall of Fame Wrestler Sergeant Slaughter and were given a camouflage baseball cap as they entered the gates, courtesy of Budweiser. SGT. Slaughter leading the crowd in Take me out to the Ballgame! 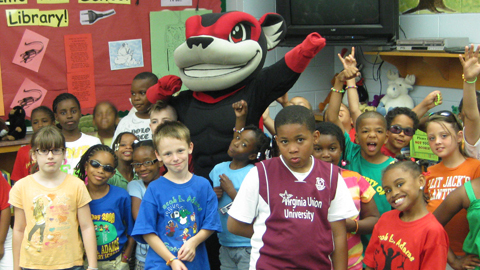 In the Flying Squirrels Inaugural Season, we also launched our inaugural reading program, “Go Nuts for Reading!”. 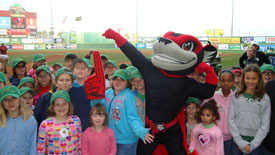 Elementary school students throughout the Greater Richmond Area participated by reading eight books over two months to earn a ticket to a Flying Squirrels game this past spring. While at the game, students were recognized by participating in a pre-game parade around the warning track led by Nutzy! 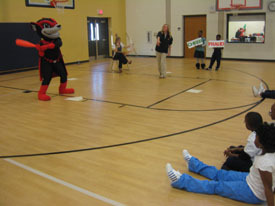 To encourage the children to read, Nutzy and his friends went out to the schools and put on assemblies talking to the students about the benefits of reading, our reading program and Nutzy even acted out “Casey at the Bat”! The classroom that read the most books total from each school district was rewarded with a pizza party and visited by a Flying Squirrels player and Nutzy! In our first year, over 32,100 students participated within nine school districts! Nutzy at a reading assembly acting out "Casey at the Bat." CPR “Certified” Fun at The Diamond! On Saturday, May 29, the Richmond Flying Squirrels teamed up with the Richmond Chapter of the American Red Cross for CPR Grand Slam! 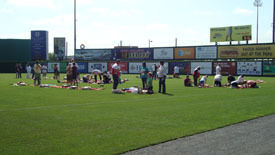 Residents in the Greater Richmond area took an online class and then finished their CPR certification training in the outfield at The Diamond! Participants were greeted by Nutzy as they checked in, then taken down on to the field to finish training. Once the course was completed, the newly certified patrons earned a ticket to that night’s Sq uirrels game and were recognized for attending the life saving training! The youngest participant certified was 13 years old–he tossed out the ceremonial first pitch! 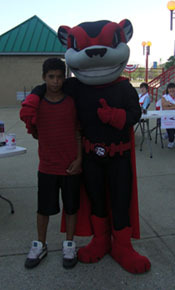 Nutzy and our first pitch winner after completing CPR training at only 13! 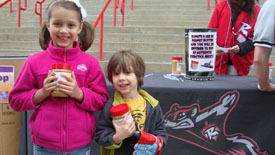 On Tuesday, May 18, the Richmond Flying Squirrels teamed up with the VA Peanut Growers to raise awareness about peanuts and the need for peanut butter for the Central Virginia Food Bank. People that brought a jar of peanut butter to the game to donate to the Central Virginia Food Bank were entered into a drawing to win an authentic Flying Squirrels practice jersey. Along with raising awareness about a great organization that is in constant need of support, we had a lot of fun as well as we were not only joined by two peanut mascots (one from the Virginia Peanut Festival & one from VA Diner) but also Peanuts characters Charlie Brown, Lucy and Snoopy! Samples of peanuts were distributed to our fans as fun was had by all in a tribute to one of Virginia’s most well known foods, the peanut! Two happy Squirrels fans donating for a great cause! 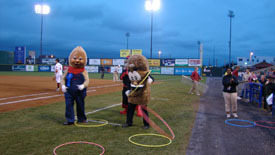 Peanut Mascots helping with an on-field contest-Peanut Ring Toss!